was born in Fukui (Japan) in 1985. After he has completed the Program of Teacher Education for Music (Bachelor) with a major in piano with Prof. Masanobu Koshino at Fukui University (Japan), he moved to Germany in order to study piano with Prof. Karl Betz at the University of Music in Würzburg, and he has completed the Program of Music in Performance with a major in piano (Diplommusiker) at the University of Music in Würzburg in 2011. Since October 2011, he was studying at the Folkwang University of Fine Arts and Music in Essen with final destination "Master of Music Professional Performance" with a major in Piano with Prof. Arnulf von Arnim. And March 2014 he has it completed. In addition, he attended master classes or private lessons with Peter Fuechtwanger, Márta Gulyás, Wolfgang Manz, Friedemann Rieger, Grigory Gruzman, Fabio Bidini, Wolfram Schmitt-Leonardy and Dina Yoffe. 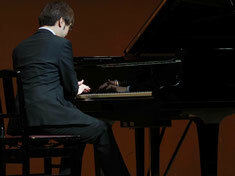 He also received Pianoduo Lessons with Evgeni Sinaiski and the Fortepiano Lessons with Prof. Glen Wilson. He previously took part in several concerts, such as the "Chopinabend" in March 2010 at the University of Music in Würzburg, the concert "Junge Meisterpianisten" in January 2011 at the Steingraeber Haus in Bayreuth, "Freitagskonzert am Museum Dom" in Trier in February 2012 etc. Being highly succesful in various competitions, Toshihiro Kato won the 3rd Prize at the 11th Internationel Competition ”Don Vincenzo Vitti” (Italy) in 2012, the Encouragement Prize at the Nagoya-Preliminary of the International Chopin Piano Competition in Asia in 2007, the Education Council Award (2nd Prize) at the Music Competition of Fukui Prefecture in 2002 etc. He was also teaching at the Music school Kaiserswerth in Düsseldorf from 2013 to Feburary 2014.